The evening brings with it those much-dreaded cravings and hankering for sweets. So we suggest drinking a Shape Shake as a dinner supplement. Of course, you can also drink a Shape Shake with breakfast or lunch. 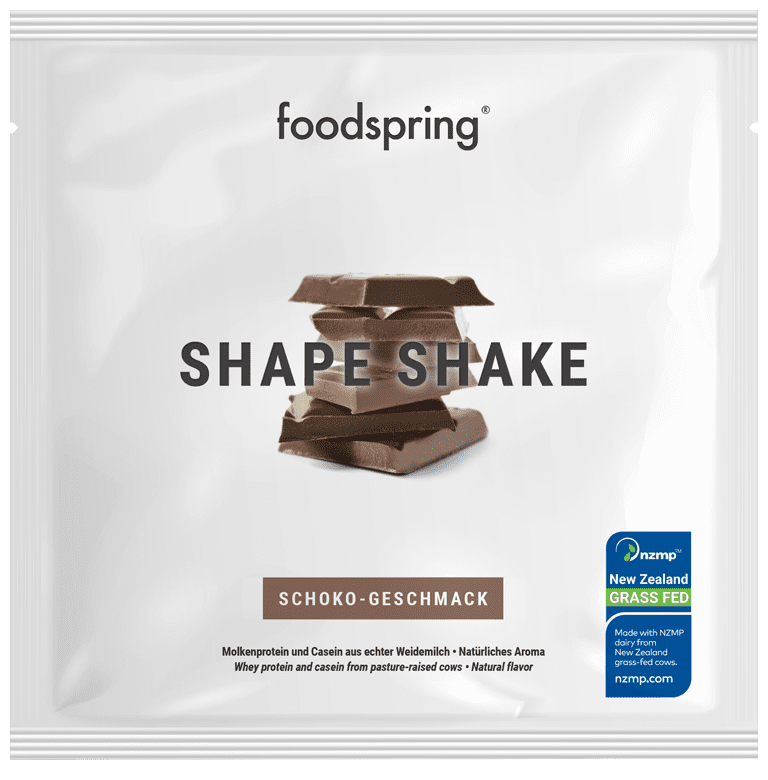 Does the Shape Shake make you thin? Thanks to its low energy balance, the Shape Shake can help reduce the number of calories consumed in a day when used as a meal supplement. Regularly maintaining a calorie deficit is the basis for weight loss and burning excess body fat. But we say: Fit is the new skinny! The Shape Shake’s high protein content means it also helps dieters to maintain and build muscles. When combined with a balanced exercise routine and adequate nutrition, the Shape Shake is the ideal supplement for attaining your dream body and staying in shape. What's wrong with a soya shake? In creating our Shape Shake, we purposely chose not to use soya. Many diet concepts use soya to achieve a feeling of being full. However, the origins of these soya beans is often an unknown. Chicory is healthy and creates a lasting feeling of fullness. That’s why our Shape Shake combines the qualities of the chicory root with high-quality protein from pasture milk, and L-carnitine, which helps you stay in shape on all levels. It also means we don't need to use artificial sweeteners. The pasture milk proteins offer a higher organic value, and – very important – a better taste. The plain-flavoured Shape Shake contains absolutely no sweeteners so that you can drink one whenever you want. The Shape Shake is gluten free. Due to production factors, the product may contain traces of gluten. No matter what your goals are, a healthy diet and staying active are crucial to achieving your dream body and keeping it. Unlike classic formula diets and diet drinks that simply shoot for fast weight loss, we intentionally take another approach with our Shape Shake. To lose weight in a healthy way, we suggest that you only supplement one meal with the Shape Shake and continue to get your primary amount of daily calories through solid foods. Your meals should always be built around complex carbohydrates, essential fatty acids and high-quality proteins, plus fresh fruit and vegetables.